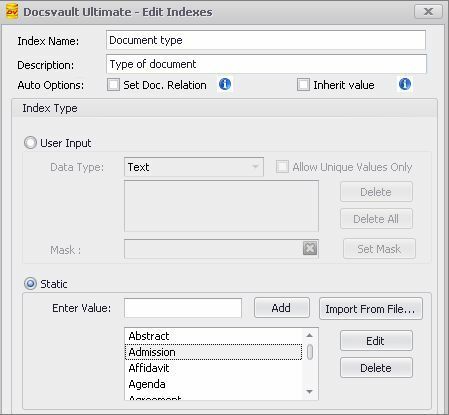 •You can add static index values by this option in Docsvault Server Manager as well as in Docsvault Client. To edit the indexes from the client application, go to Administration > Profile/Indexes. •Enable Inherit Value to inherit the index value from parent folder. When index value is set to inherit from parent folder, values will be inherited even if a different profile is assigned to the parent folder. Instead of choosing to enter index values one by one using 'Add' button, selecting 'Import from File' option is quick way of importing values from a xml or csv file. •Click on Import From File... button to import static list of values form either a xml file or a comma separated value file. •Select a value from the list and click on Edit button. You can change the Index type of an existing Index i.e Static to User Input and vice versa. This conversion is possible for only Text data type indexes. •You can change the data type of an Index from Numeric/date to Text data type. Note that once converted it is not possible to convert it back to Numeric/date data type. •Only Text data type indexes can be converted from Static to User Input and vice versa. 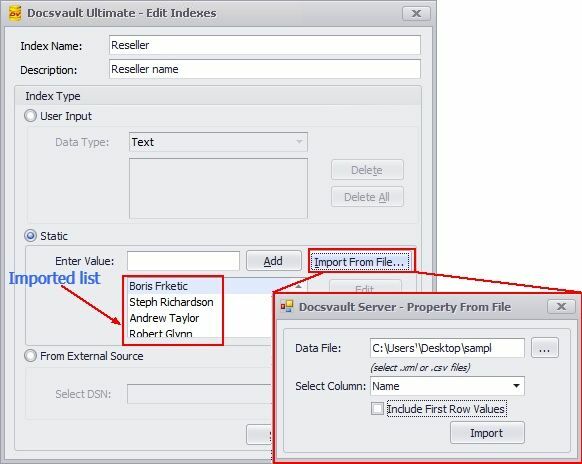 •Admin or administrative group members can import the static list in Docsvault Server Manager.